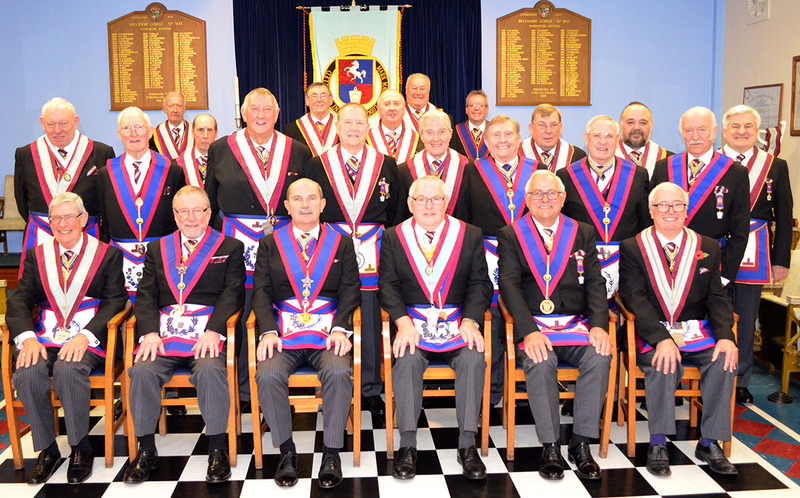 On Saturday 5 November 2015, Kent Installed Mark Masters No 999 held its annual Installation meeting. The incoming Master, WBro Fred Brown, APGM, was Installed in an excellent manner by WBro Howard Pashley, the outgoing Master. With over 90 Brethren attending the meeting, the room at Tovil was absolutely packed, making for a thoroughly enjoyable meeting. The numbers were swelled by Brethren receiving MBF collarettes, showing how the Festival has really gained traction across the Province. With 78 remaining to dine, the day was rounded off with a happy and convivial Festive Board. The pictures show the new Master with the PGM and chains, all of whom have held the Office of Master. The gathering of Lodge officers radiates the happiness of the day. If you are an Installed or Past Master and have yet to join KIMM, a warm welcome awaits you in this most happy and prestigious Lodge.